Many of us have enormous iTunes media libraries that simply become too large to reasonably store on your Mac’s main hard disk, so an obvious solution is to move your digital library to an external drive. I recently purchased a new 27″ iMac while parting from my old 2006 Macbook when I realized how much of a pain it was going to be to transfer my entire iTunes library over to the new iMac. This may be a simple process for those who have 20GB or less of music but in my case I was dealing with over 150GB of tunes. Scavenging through my apartment to find a large enough external hard drive wasn’t a problem but what worried me was the time it would take to transfer the music from the Macbook to the External and then from the External to the iMac. This is not something I want to keep doing with each new Mac I purchase, so I decided to leave the music on the external permanently. The popular techblog Lifehacker has an great how-to up directing users painlessly through the process of relocating their iTunes media library to an external drive so you can save precious disk space or in my case time. Of course it is important to emember to backup your data first, in the odd event something goes wrong (I wouldn’t be too happy if I lost 150GB of music!). Here’s the LifeHacker Guide or you can check out our own guide to move your iTunes library which works for external drives or other locations. 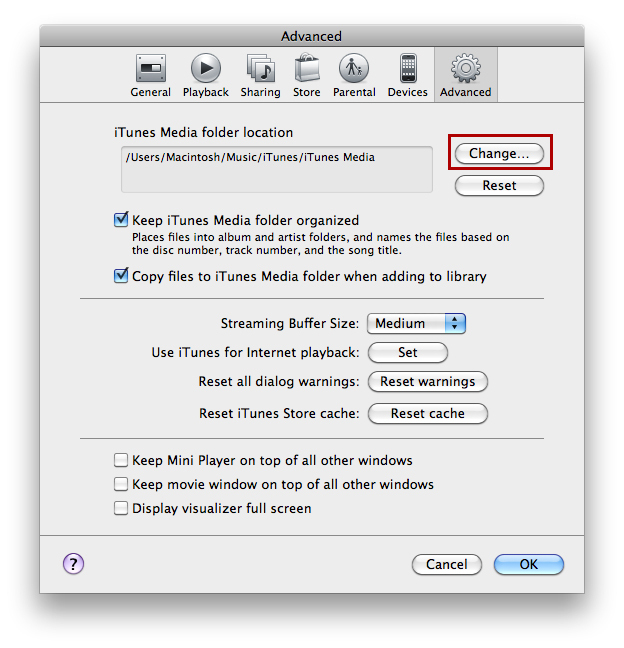 Using this method you can move your entire iTunes Music library to anywhere, including an external hard drive. Next, copy that entire ~/Music/iTunes folder to the new desired location. This may take a while depending on how large your music library is. Click the ‘Advanced’ tab and you’ll see the location of your iTunes music library like the screenshot below. Click the ‘Change’ button and navigate to the new iTunes music library location (where you copied the ~/Music/iTunes/ folder too). Now click ‘OK’ and your iTunes library is set to it’s new location! The iTunes music directory stores all of your iPhone/iPod ownership data, so moving this directory also moves ownership in that sense. This is achieved in practically the exact same way as the method above, you just need to connect the two Mac’s together either through a network or through something like firewire target disk mode (obviously this only works on Mac’s with firewire support). If you’re lucky enough to have both of your Mac’s with Firewire support, then hook a firewire cable between the two, and reboot one of them holding down T to place it into Target Disk Mode. When the machine boots it will act as an external hard disk on the other Mac, so you can easily and very quickly copy the contents of your ~/Music/ folder to the desired location. Note that the above methods work all more or less the same with Windows PC’s as well, except that the Music/iTunes directory is usually located in ‘My Documents’ but you can transfer it to a Mac (or vice versa) or PC just the same. Hi Kevin, this is so helpful so far. thanks! I have successfully backed up and copied all of my music to an external hard drive. I tried to set the itunes library to the new location, and it seemed to work, but when I unplug my harddrive, all of my itunes music is still accessible on my compute. How can I entirely move it? My computer is pretty full and really slow, so I’m trying to move itunes to an external drive primarily to free up space on my macbook. I’ve also tries deleting the files, but then when I plug in my external harddrive and click on a file to play it, it downloads right into my library on my macbook! How can entirely move the library, so that it doesn’t take up any space on my macbook?